Explanation: What is not pretty about the above picture? In a word: smog. In 2000 October the orbiting Space Shuttle Discovery photographed upstate New York just at sunset. 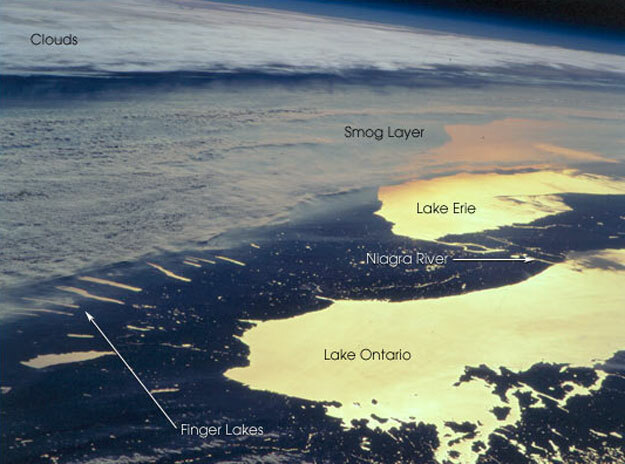 Visible is golden sunlight reflecting from two of the Great Lakes (Erie and Ontario), and several of the Finger Lakes. Between the clouds at the top and ground at the bottom, however, is a trapped layer of smog. Smog is mostly ozone but may contain small amounts of volatile organic compounds. As opposed to "good smog" in the upper atmosphere, "bad smog" near the ground is created mostly by humans. In the upper atmosphere, ozone reflects back harmful ultraviolet radiation, but when it occurs near the ground, it can be inhaled. 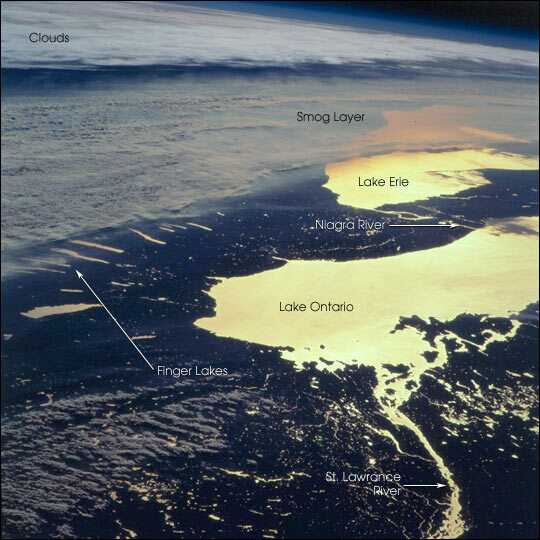 Smog continues to be studied with an eye for how it develops and how it affects human health.